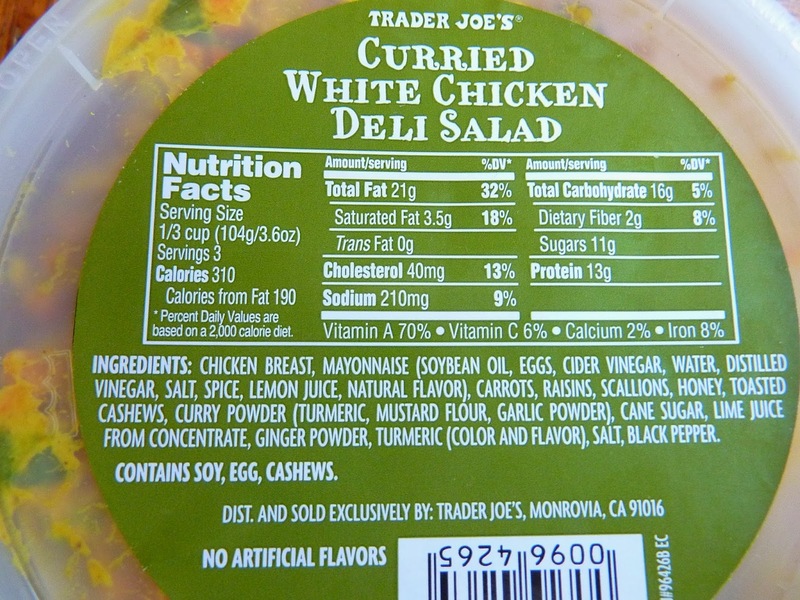 Are you a fan of chicken salad? Are you a fan of curry? If you can answer "yes" to both of those questions, then you'll love this stuff. 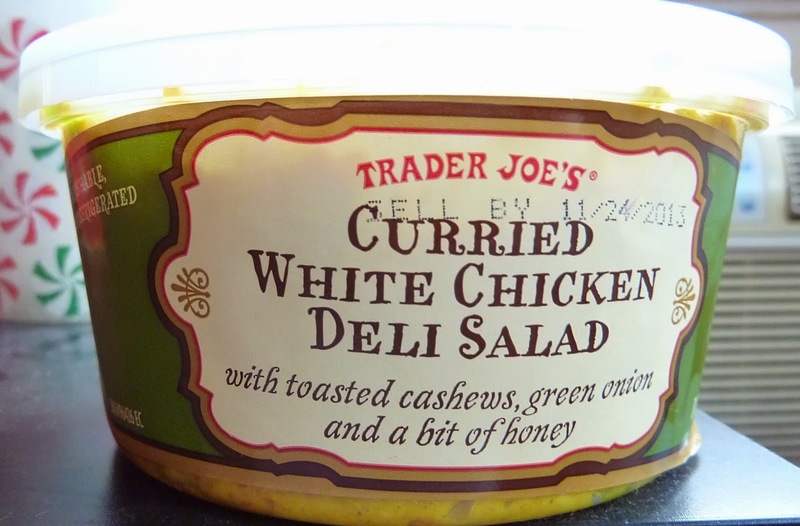 Before I tried this, I imagined what the perfect curried chicken salad would taste like. And the product matched what I imagined. And I mean exactly matched. This is the archetype. This is the genuine article. This isn't the shadow of curried chicken salad on the wall of the cave, this is the curried chicken salad itself. Somewhere, some culinarily-inclined East Indian person must have married a Mennonite or Amish person from Lancaster County, PA, or somewhere else where people make near-perfect chicken salad, and the two went about creating the most amazing "fusion" dish I've had in a long time. It's every bit as good as, though in no way similar to, Bulgogi Tacos. There's just the right amount of spicy curry, just the right amount of chicken, and just the right amount of everything else. I should have taken a pic of the product out of the container, but I inhaled the whole thing too quickly and I forgot. Upon first glance, looking at the salad, there appeared to be an excess of raisins, but it definitely didn't taste that way. They balanced everything out juuust right. The chicken was moist, bite-sized, and had a great consistency. I ate this with a fork, straight from the tub. I could have kicked myself for not picking up naan bread while I was there. I bet this would have been killer with actual Indian bread, but it also would have made a decent sandwich with just regular old Sunbeam. 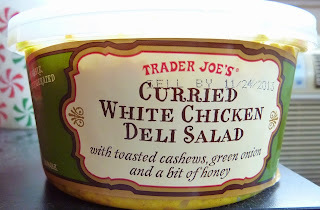 This might not be the most common purchase for us or anyone else, but I simply can't imagine curried chicken salad tasting much better than this. Sonia gives this product 5 stars. Me too. I never thought Plato would apply to chicken salad, but I guess I'll have to try it for myself and see! Glad you got that reference, lj! I think this is the first time I've seen 10 out of 10. 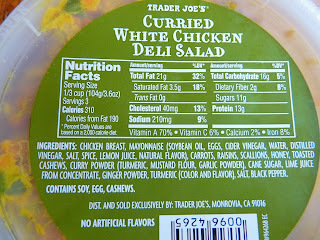 I am so addicted to TJ's Wine Country Chicken Salad, I can't imagine something better. I'll give this one a try based on your high marks. Have you reviewed the W.C. Chicken Salad? Ooh. I've never heard of the Wine Country Chicken Salad until now! Sonia and I took part of our honeymoon in wine country (Napa). That makes us experts on all things wine country, right? I love this stuff and buy it every time I go to TJ's. I like to eat it on their whole wheat sandwich thins for lunch. I am kind of amazed you ate the whole thing straight from the container in one go. Haha, yeah. I'll admit I ate most of it, but Sonia did have some too. I wish I had a TJs at the end of my block! I'll share mine! Seriously, walk out the door and be back home putting away TJ treats in 15 minutes or less, no car needed! agree on this item. it's insanely good. I agree! I think I could eat 2 tubs each week, too, Jessica. Does it have hard boiled eggs in it? No. I just read the ingredient list. Every single time I go to TJ's I get this item. It is hands down one of the best suggestions you have ever given. Thanks! Glad to be of service, Daniel. Thanks for reading our blog! An update to my addiction to this stuff: I just tried making my own version of it at home, following the ingredient label. (Mostly TJ ingredients too.) It also came out insanely good, just approximating the amounts. About a cup of TJ mayo, 6 lightly-cooked and chopped/shredded TJ chicken breast tenderloins, a healthy does of curry powder (mix of hot and Jamaican), a hake or 2 of ground ginger powder, a good squirt of honey, a squirt of lime juice, a small handfull of shredded carrot, and a smaller handful of raisins. I used walnuts instead of cashews, tho.Just mix everything together and refrigerate. (I mixed all but the chicken together first.) Really yummy! I have both TJ's and my version in the fridge right now. Both are great on a toasted pretzel bagel!! oh yeah, and some finely-chopped sweet onion b/c I didn't have scallions handy. Wow, sounds tasty! I bet your version gives TJ's a run for its money! Bought it, tried, it. Not a 10.